APRIL 2007 -- March was a busy month and April looks to be busier. Sister Marge and I have attended our first State Master’s Conference in Reno Nevada. It was held in the hotel that the 2007 National Session is going to be held in so we had a first hand look at the facilities. It was an educational conference for me and I learned much. I also had the opportunity to again meet many of the State Masters and get to know them a little better. The National Master and National Directors conducted the sessions with the exception of one session, which was conducted by an insurance specialist concerning Grange liability. It was eye opening to say the least. Granges must be aware of the liability coverage that they have, especially those that allow the public to use their halls. LeRoy Watson, National Legislative Director, spoke on ways of improving the resolution process at both the National and State Sessions. His suggestions could help the resolutions committees in their deliberations. Dori Ann Gedris, Marketing Director, laid out some of the programs the National Grange is developing and at the same time asked the State Masters what kind of programs do we want. I ask you, what are we looking for from the National Grange? We are going too have to discuss this and come up with some answers. The Leadership/Membership Director, Ed Lutrell, presented a program that I felt was very informative. I would like everyone in our state to hear it. So I have invited him to come to Connecticut and present it to us. I have set the date for Sunday, April 29, 2007 to be held at Good Will Grange Hall in Glastonbury at 1:00 P.M. Since the camp clean up on Saturday the 28th is usually followed by a Pink Sash meeting, I am canceling the meeting and holding it Sunday after the membership presentation. I hope to have as many as possible attend this important presentation. This will allow all who come to clean the camp to return home when the cleaning is done. I mentioned earlier that this month appears to be busier. 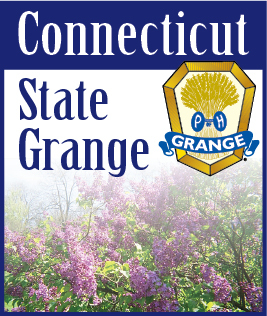 Well many of the Grange inspections will be in April. I know not all Granges will be doing degrees but I hope those that don’t will use the Obligation Ceremony or the new Welcoming Ceremony to bring new members into the Grange. I also hope all Granges will make it as easy as possible for the Deputies by answering all questions on the inspection report and having all information ready for them. This will make inspections more bearable for everyone. As I did the schools of instruction I asked everyone to make suggestions on how to improve inspections. Well I have already received several and some I think are worthwhile. I will be discussing them with the Deputy staff so you can expect some changes next year. This month is also important to many of us because of the religious holidays. Marge and I wish all of you a Happy Easter or Passover Season.